WATERCOLOR AND PASTELS ON PAPER, 14 1/4" BY 21 1/4"
This is yet another amazing work in watercolor and pastels by Thomas McNickle. 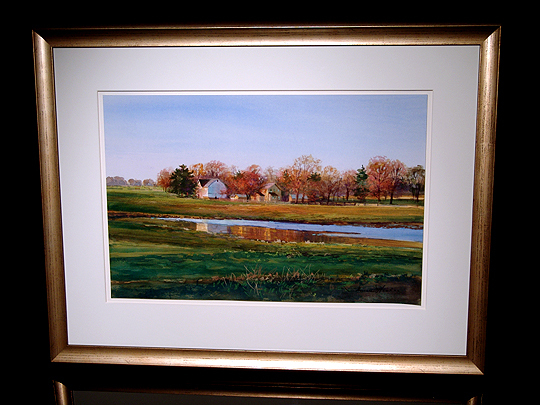 It was included in Thomas' May 2004 show at Jerald Melberg Gallery... the focus of the show was mostly Thomas' oils, but there were a number of watercolor works included as well. When I saw this work in the gallery two weeks before the show opened, I had an "ah hah!" moment... when I saw it hung on the wall one week before the show opened, I told Jerald I wanted to acquire it. 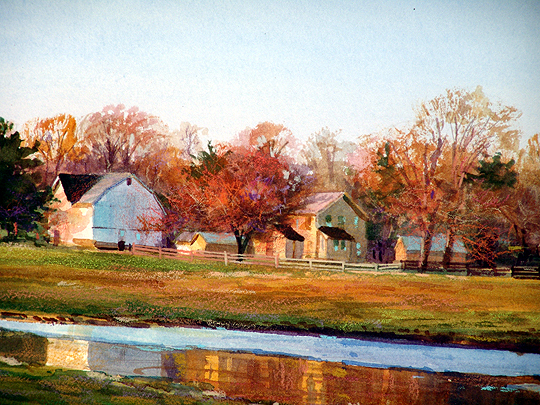 Painted in the late winter of 2004, this work shows a farm in rural western Pennsylvania, near Thomas' home. As the title of the work (Last Of The Ice) indicates, the last of the winter ice is melting... you can see it in the foreground. The ice doesn't show a reflection, but you can see an incredible reflection in the water... the farm buildings in the background are convincingly reflected. 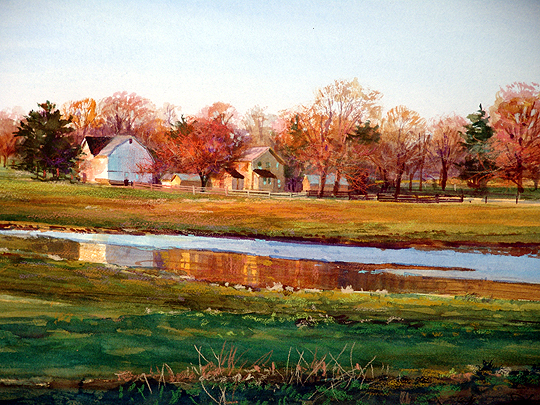 The scene depicted here by Thomas' doesn't seem extraordinary to begin with, but the way in which he has captured it using his watercolor-and-pastels technique makes it quite special. As with all of his other works in my collection, I am quite pleased to have been able to acquire this work.